For her 18th birthday this year, my daughter received a Koh-i-noor watercolour set of a very clever design. 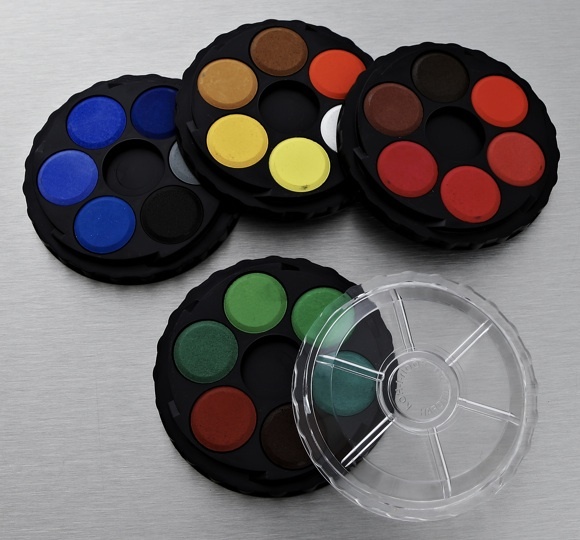 It has four round discs, each with six colours and a depression in the middle for mixing. The discs screw together, one on top of the other, so that the whole set is about the size of a can of tuna when closed. The gift was a surprise from her Dad, who got it in London on the advice of an artist friend. When she opened it I think I was even more thrilled than she was, because it was just like a paint set I had at her age! Mine was green rather than black, but otherwise it was exactly the same. I loved that set and used it for years, and until now I had never seen another one like it. In senior school I loved working with watercolours, and the art teacher was happy to let me get on with painting what I wanted to with my own stackable watercolour set. I had a special Chinese paintbrush too, dark red with soft bristles that came to a perfect point. 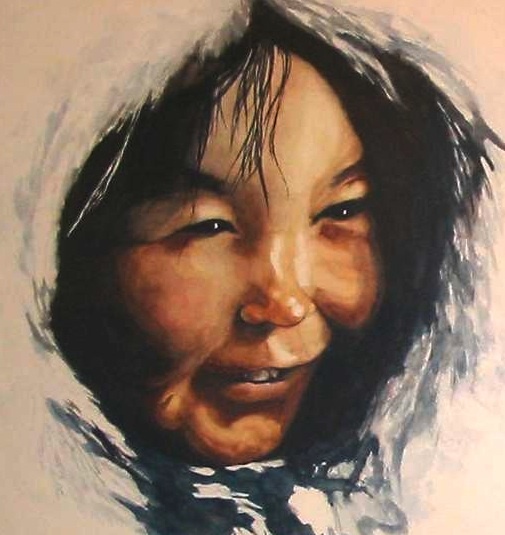 The rich colours of my special paint set made it possible to get those warm skin tones and deep black of the shadows. My Chinese brush with its fine point allowed me to capture the loose hair on the child’s forehead. There is nothing like working with real paint on real paper. But more and more these days, artists are turning to computers to produce very similar results that can be shared electronically and reproduced countless times. Many children’s books that were once illustrated the “old fashioned” way with pen and ink or other traditional media are now being brought to life digitally instead. 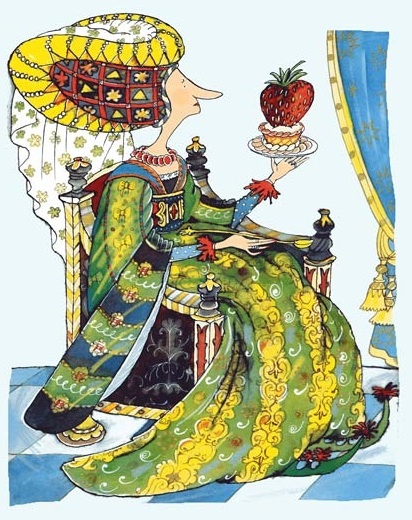 The central character of this story is an impossibly demanding monarch, Queen Pernickity, who wants only the very best of everything. You can see from the illustration above that Margaret has created texture and lots of detail with a fine ink outline and rich colour using watercolours. The Enchanted Flute has recently been released as an iBook, and on her website Download Children’s Books you can watch a short video demonstration of Margaret drawing Queen Pernickity using a computer and a programme called ArtRage. As she points out, it takes much less time working on computer, and it’s easy to correct mistakes. The finished effect is very similar to real paint on paper, and it can be sent directly to publishers and printers to produce a finished book. So is there any future for real paint and paper? The paintbrush moves around an x and y axis (two metal rods) powered by pulleys and wire cables. 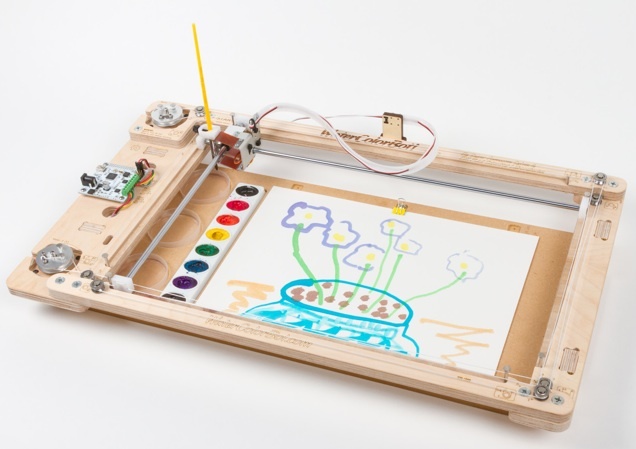 In this way a drawing made on a computer can be reproduced multiple times, and the WaterColorBot becomes a type of printer. The idea began with a 12-year-old girl called Sylvia who wanted to make a robot for a science fair. She has her own website, Sylvia’s Super-Awesome Maker Show, where she demonstrates fun creative projects. When she took her idea of a painting robot to the people at Evil Mad Scientist Laboratories they were happy to help out! Today is the 11th day of the 12th month, 2013. People are getting quite excited about it, as this sort of sequence won’t happen again in the calendar for another 89 years! (The next one will be 01/02/03 on the 1st of February, 2103). You can even add the time into the sequence. 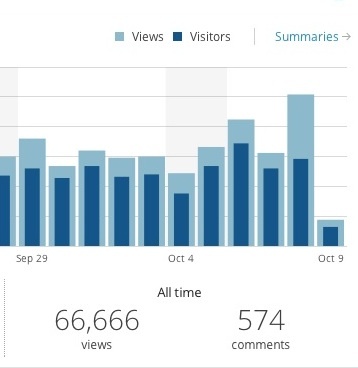 If I’d been a bit quicker I could have written this post at 09:10 on 11/12/13! It’s fun looking at patterns like this in birthdays and other important dates. Maybe you have a good birthday with an interesting number. I know a little girl who was born on 11 August 2011, so her birth date is 11/8/11. My grandmother was born on 11 May 1905, which is 11/05/05. What if you were born on September 9th, 1999? Then your birth date would be 9/9/99. The 3rd of March 2003 would give you 03/03/03! Apparently lots of people will be getting married today for good luck. A retired science teacher in America called Ron Gordon is very interested in quirky dates, and he is offering a cash prize of $1112.13 for the best celebration today. Back in 1981 he invented “square root day” (on the 9th of September, since 9 x 9 = 81). There is another square root day coming up in a few years’ time: 4 April 2016. I wonder if he’ll be offering any more prizes! He is also looking forward to “trumpet day” on 2/2/22. If you like number patterns you might like to try this BBC website where you can find the last two numbers in a sequence to open a safe! Inside you’ll see some pretty weird prizes, like a fancy sports car and an emu. Or is that an ostrich? 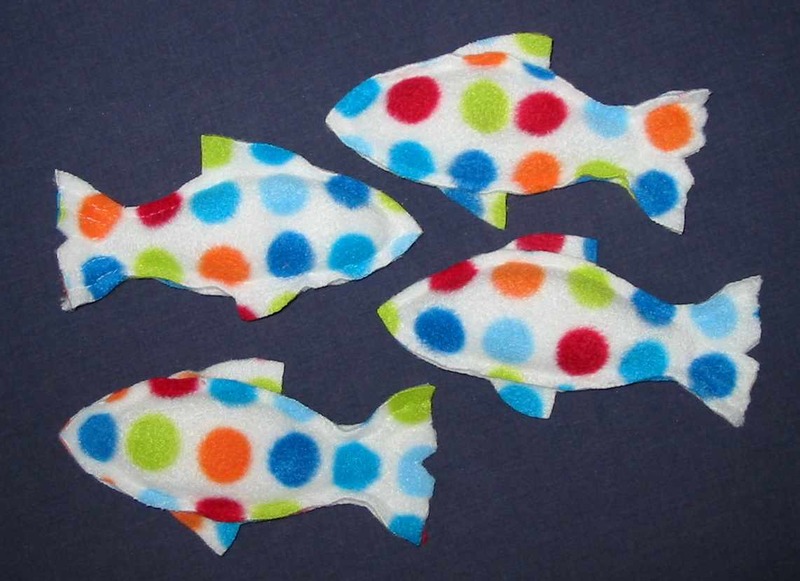 Here’s another great website full of number patterns and games you can play. It’s called Maths is Fun! It will explain triangular, square and cube numbers. 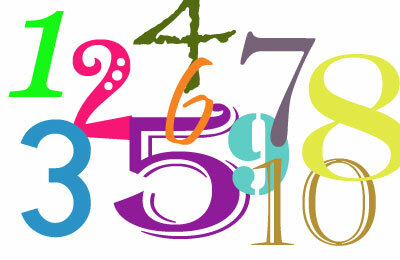 I didn’t know numbers came in so many shapes! Do let me know if you have a quirky number for your birthday. There must be lots of you born in the first decade of this century (2001 to 2010 on the 1st of January, 2nd of February, 3rd of March and so on…) I want to hear from you! Hopscotch Theatre does it again! Since I started working with Hopscotch Theatre in Glasgow I have been invited to dress rehearsals of all their new school productions. 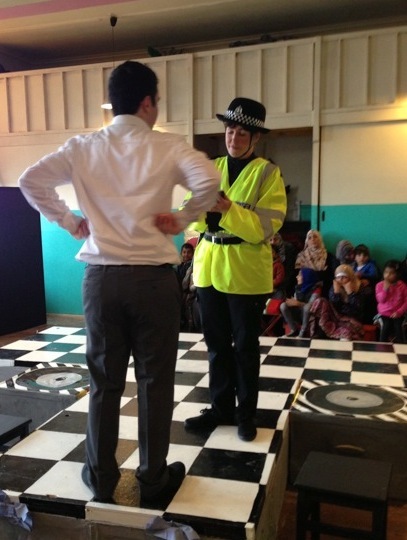 Recently I went to see my brilliant mother penguin Louise Montgomery performing as a police officer in Fire! Police! Ambulance! There was a big audience of parents and children, and we sat around four sides of a raised black-and-white platform stage. 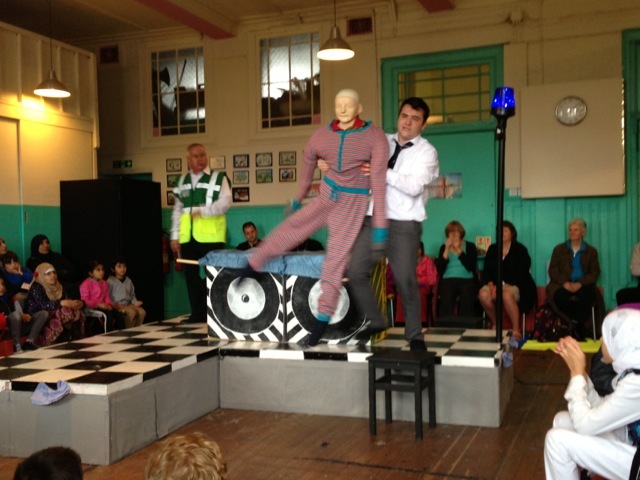 As the actors did a lot of singing and dancing, I was nervous that someone would fall off! Luckily nobody did. The main character is a teenage boy called Peter who tends to panic at the slightest problem. Jason Park plays this role with plenty of energy, running at full tilt in one direction and then another at each new “crisis.” His father, who is played by Wullie Brennan, is very patient with his over-excited son as he tries to explain the difference between a real emergency and something less important. 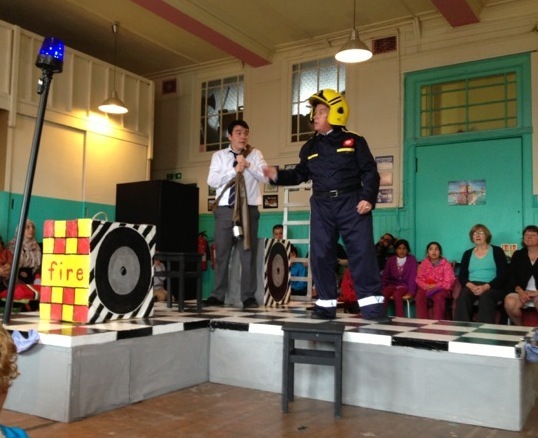 Through the course of the performance (about 55 minutes in all), young Peter learns all about the three emergency services. First is the police, and the constable teaches him the first lesson about what to do in an emergency: the number to call. 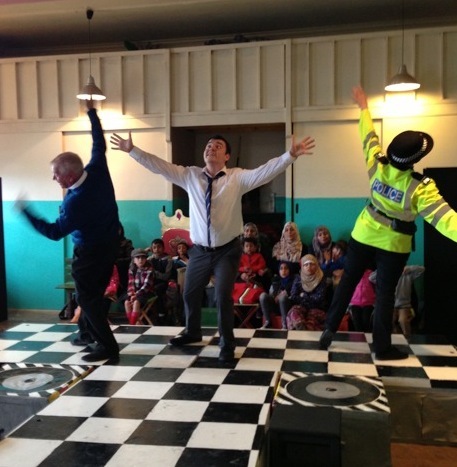 All three actors break into a brilliant performance of the 999 Song, and they teach the audience to sing the chorus. To listen to a recording of the 999 Song, click HERE and look on the right-hand column for The 999 Song – with vocals. Next Peter spends some time with a firefighter and an ambulance driver (also played by Wullie Brennan) and learns what kind of emergencies require their help. Peter’s father has a new job answering the phones at the Emergency Services call centre, so Peter also learns how important it is NOT to dial 999 for a joke. The production was written by Raymond Burke (both words and music) and it’s full of action, great songs and silly humour to keep a young audience fully engaged. The actors interact often with the audience, and the valuable information the children learn is conveyed brilliantly through rhyme and repetition in a fun way. In addition, teacher Mark McLaughlin has produced some excellent Classroom Resources for schools which can be downloaded free from the Hopscotch website. This way teachers can reinforce the main points of the show later in the classroom. The current tour of Fire! Police! Ambulance! is appearing in schools for the next six weeks, and there are dates still available after 21 October. In my opinion it’s a winner! After many months of planning and preparation, Pink! 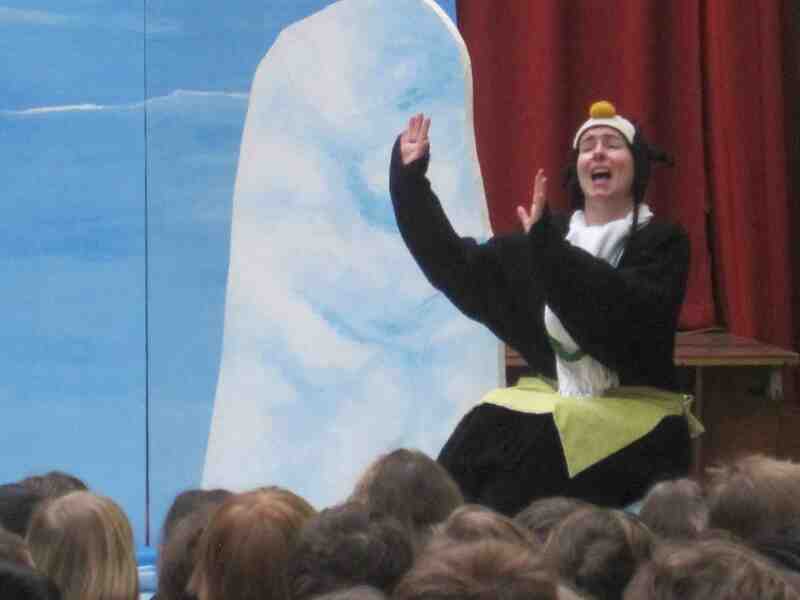 the Musical set off on a 12-week tour around Scottish primary schools at the beginning of March. 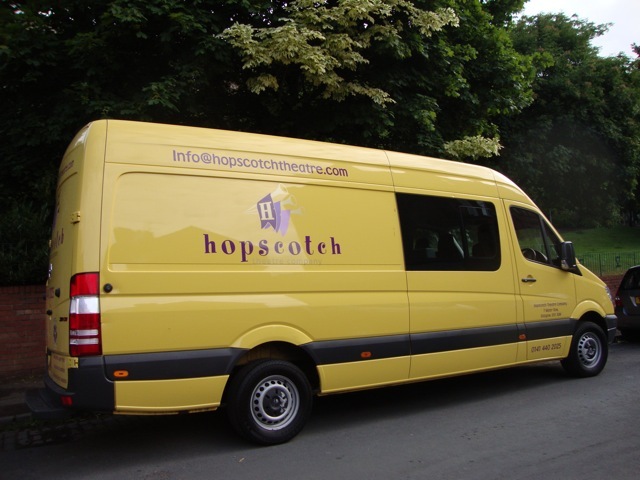 The yellow Hopscotch Theatre van is now zipping across the land, perhaps to park up in a playground near you! Patrick’s Mum is played by Louise Montgomery, who sings a sweet lullabye to send Patrick to sleep. You can see in the picture below she is singing about the stars twinkling up high in the sky. 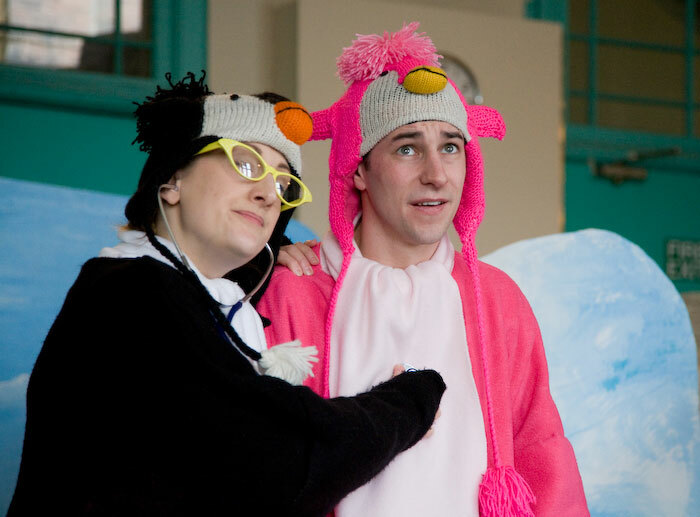 Louise also plays Patrick’s best friend Arthur who tries to comfort Patrick about his terrible predicament. 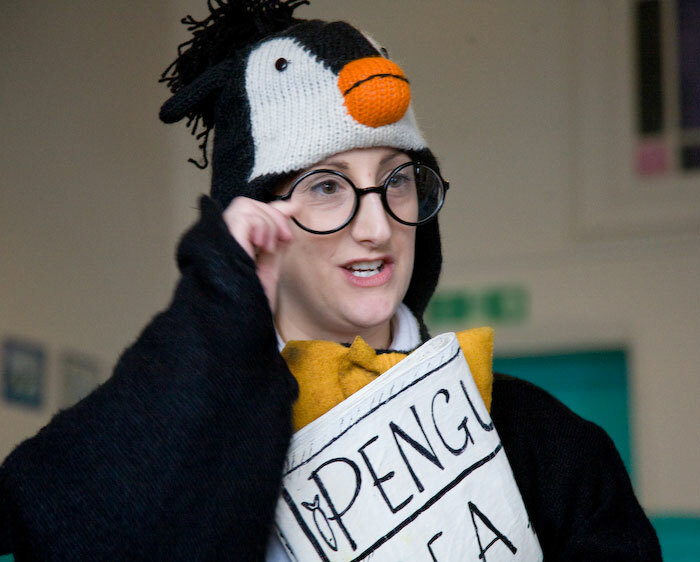 Lucy Avison has to be three different penguins! She plays Patrick’s Dad, his other best friend Lulu and Doctor Black who can’t figure out how to fix Patrick’s mysterious pinkness. 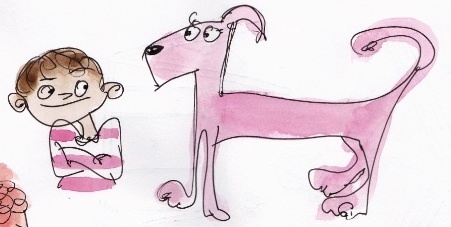 To show the difference between all of Lucy’s characters, the designer Socks Rolland looked at the illustrations of Pink! by Margaret Chamberlain and chose some simple props to give each one. So the Dad has big round glasses, a bow tie and a newspaper, the doctor has 1950s glasses and a stethoscope, and Lulu wears a bright yellow bow on her head and carries a school satchel. The other challenge for Socks the designer was how to create a flock of flamingos. 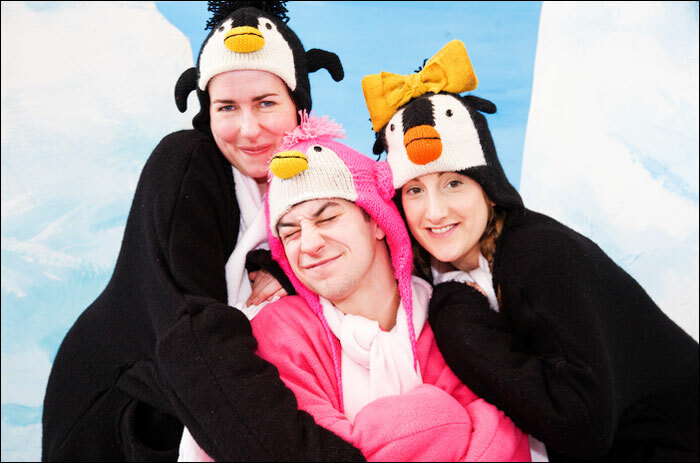 With only three actors to work with, this would prove rather tricky… Because he is pink, Patrick decides to swim to the southern tip of Africa where he thinks he might fit in better with other pink birds. 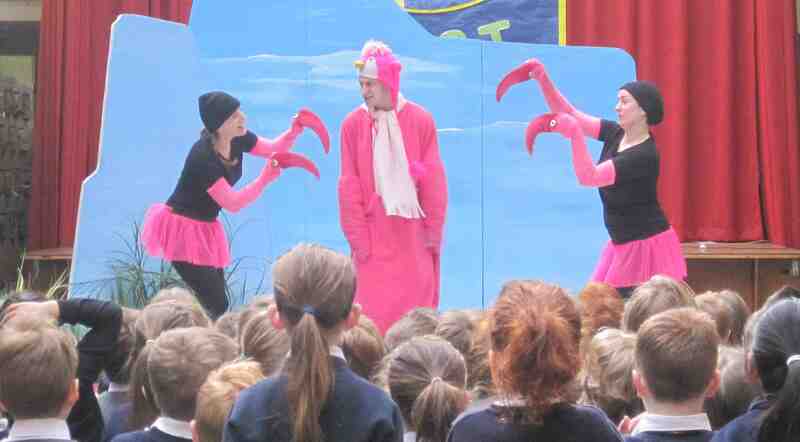 The flamingos are perfectly polite, but poor Patrick struggles to do anything they can do. 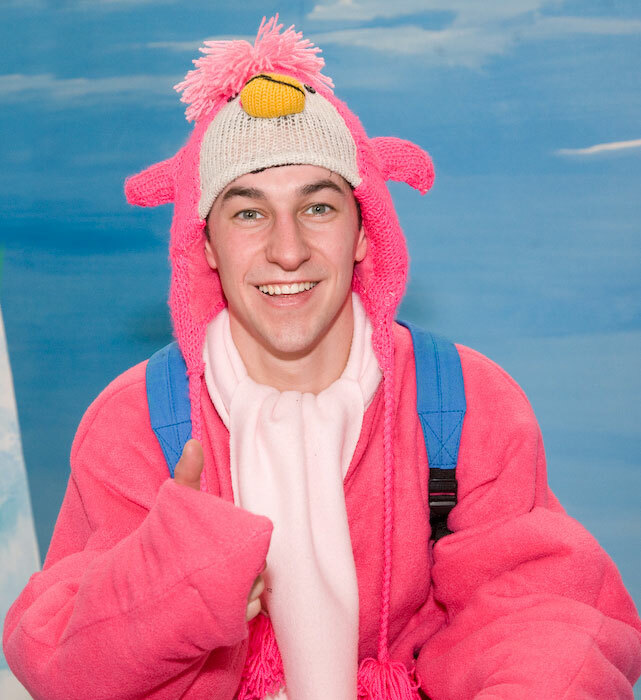 Here is Patrick meeting the flamingos for the first time. Socks has made their long necks and curvy beaks beautifully, and they look very much like the illustrations in the book. 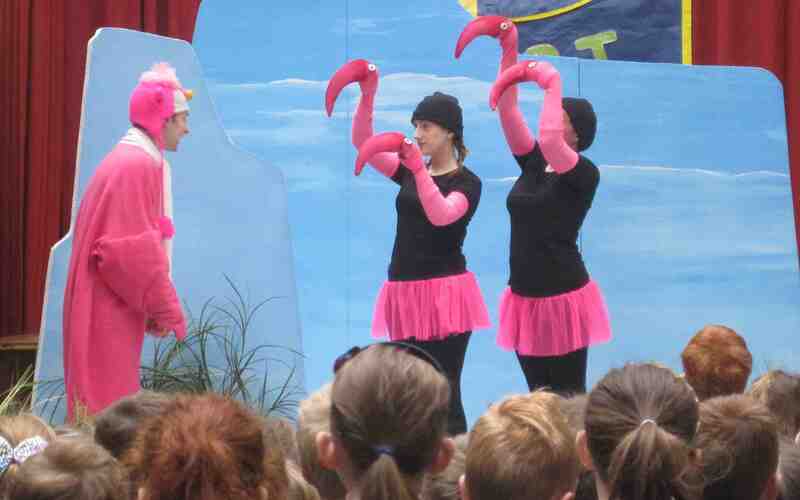 The little pink tutus give an impression of the flamingos’ bodies, and Lucy and Louise move the heads around as though there are four birds talking to Patrick. As you can see, Patrick is very frustrated that he can’t do anything flamingos can do, so he decides to leave Africa behind and swim back home again. His friends are delighted to see him, and he gets to tell the whole class about his adventures. In the end, Patrick discovers that being different is okay, and that his friends love him no matter what. 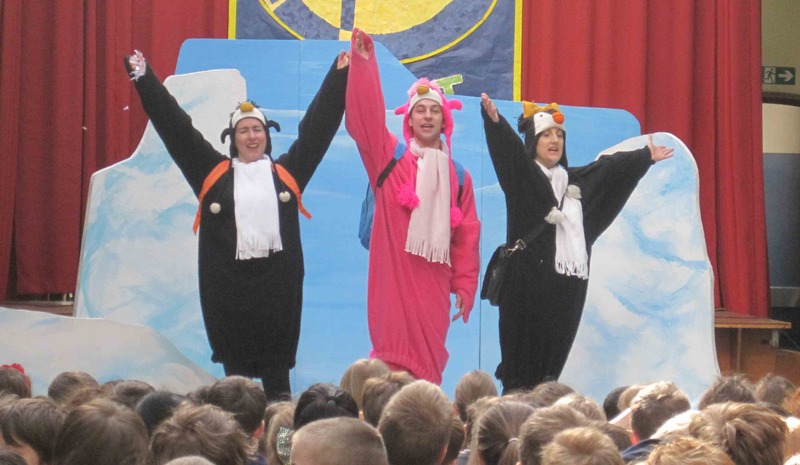 The three penguins lead the children in a final rendition of the Fun to be a Penguin song with actions. 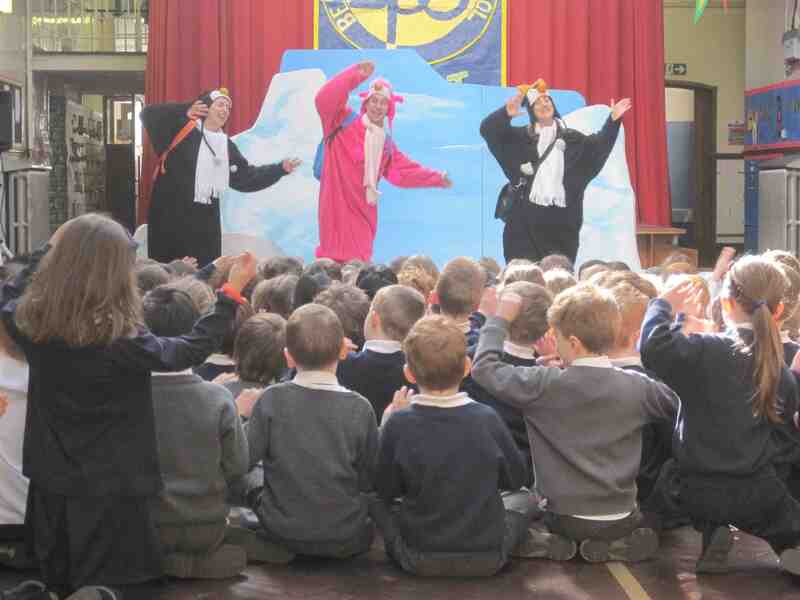 Most schools are able to listen to the song in advance so that the children already know it when the show comes to their school. 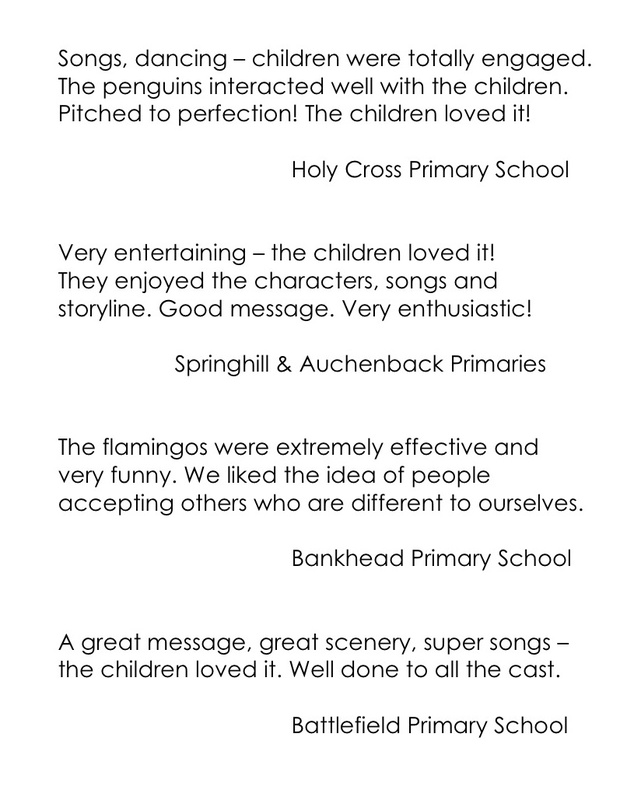 Just a few of the brilliant comments we’ve had so far! 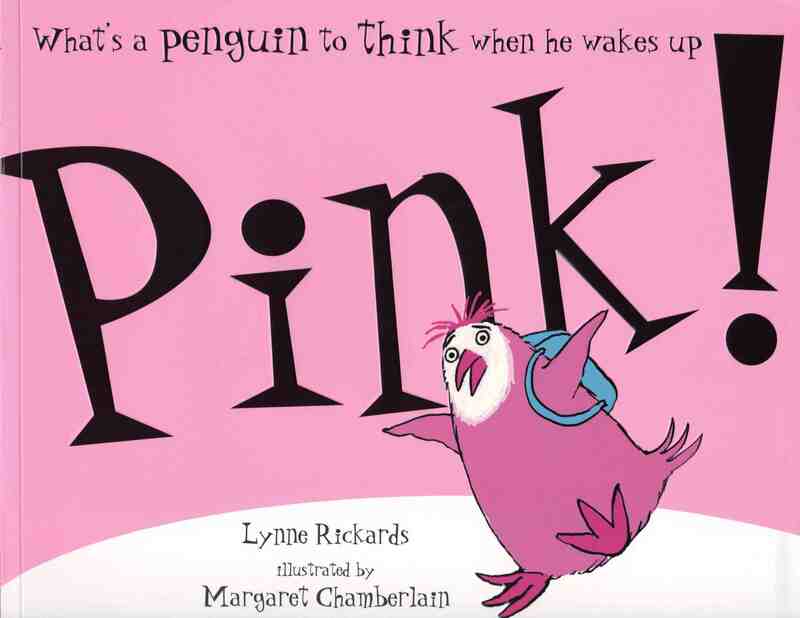 Click HERE to go to the Hopscotch Theatre website where you can download the Pink Resources and listen to the Fun to be a Penguin song. There is also a short video about the show produced by actor and filmmaker David Goodall, which you can see HERE. Finally, I must thank Creative Scotland for the generous grant that made Pink! the Musical possible, as well as Sense Over Sectarianism and the Robertson Trust who have each funded an extra four weeks of touring to bring the musical to thousands more children this spring. The Gordon Fraser Charitable Trust has also funded performances in ten primary schools in Inverclyde. With all this support we are reaching out to children across the country to help them learn to respect difference and celebrate diversity. I hope one day we can make bullying of all kinds a thing of the past. Every once in a while I get a little reminder of why I have the best job in the world. Today I received three lovely packages in the post. 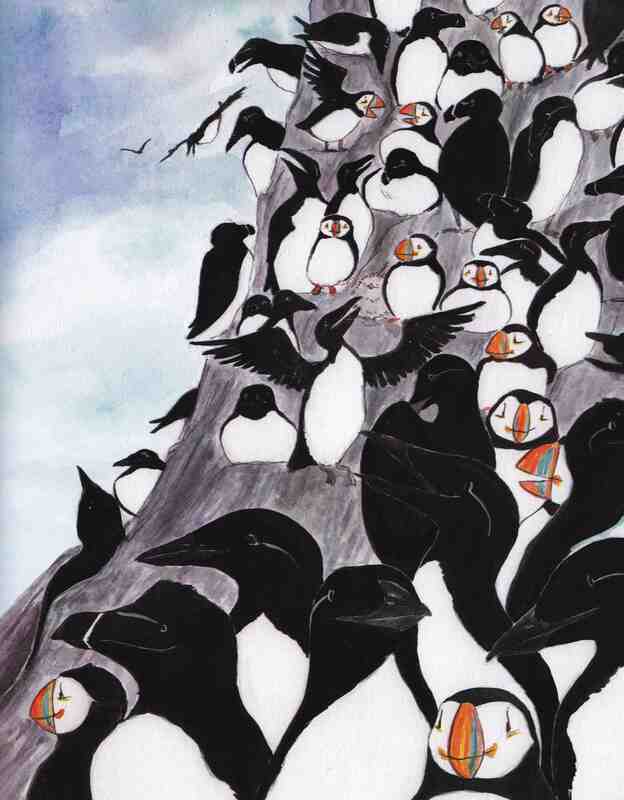 The first two were addressed to Lynne Rickards (author) and were decorated all over with whimsical puffins. Inside I found 48 letters and 15 fantastic drawings from the P2 classes at St Matthew’s Primary School in Bishopbriggs! 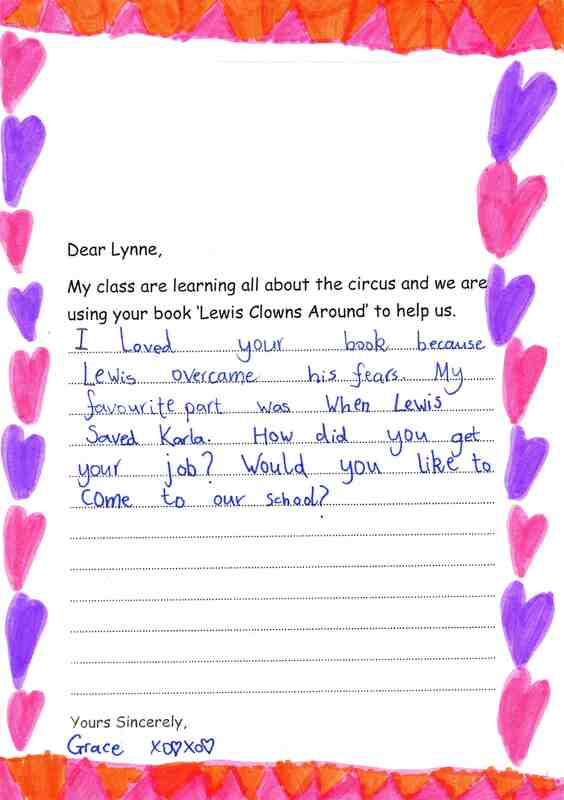 Their teacher Mrs Hannah explained in a note that they had been reading Lewis Clowns Around and using my Puffin Pack to learn all about the circus. 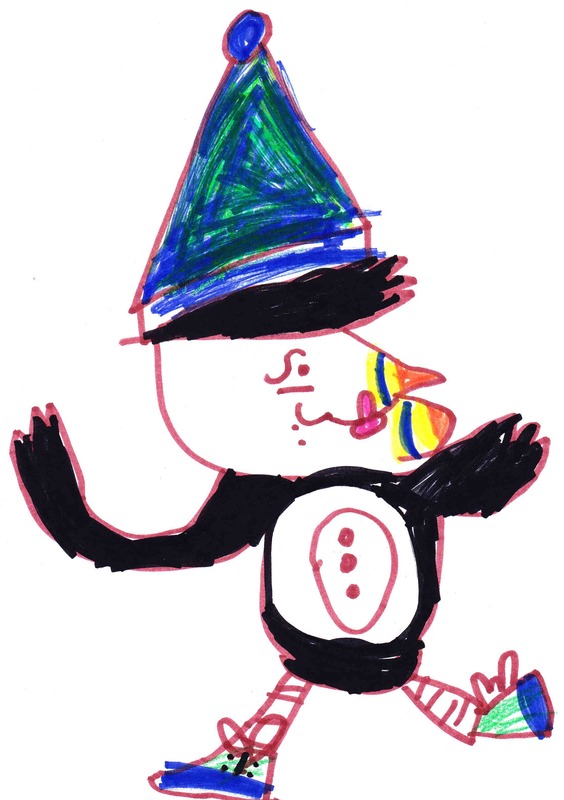 Here is one of the fabulous puffins the children drew on the outside of those two manilla envelopes. As you can see, there are some talented artists at St Matthew’s Primary! The children all wrote to tell me how much they enjoyed my book, and many of them asked me if I would come and visit their school. How can I possibly resist? All the children’s letters were beautifully illustrated with so much imagination! I was also very impressed with their handwriting, as they are all only six years old. They told me about their favourite part of the story (such as when Lewis flies up to rescue Karla koala at the top of the tent). I was very pleased to learn that not only is there a Lewis in the class, but there is also a Carla! She told me her favourite part was when she saw her name in the book. 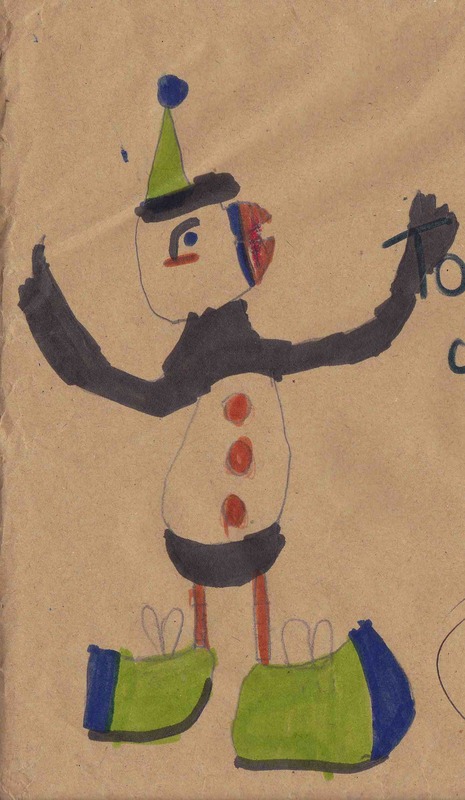 Eran sent me this brilliant drawing of Lewis the clown, with his pompom buttons and colourful beak. I think it looks just like him. He’s clearly in a hurry, but he’d better watch where he’s going or he’ll trip over those big clown shoes! 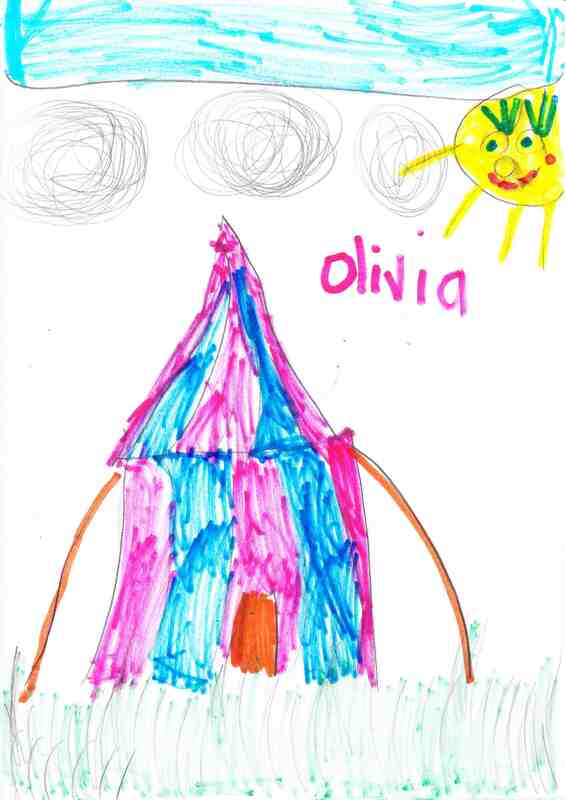 Olivia decided to draw the stripy circus tent. She has cleverly remembered to add the ropes that hold the tent up, so it won’t fall over or fly off in the wind. I sat for a long time looking at all the children’s letters and drawings, thinking how lucky I was to be a picture book author. Who else gets such wonderful surprises in the post? And then I remembered the third envelope. It was from my publisher, and inside was a copy of my new book, Harris the Hero. 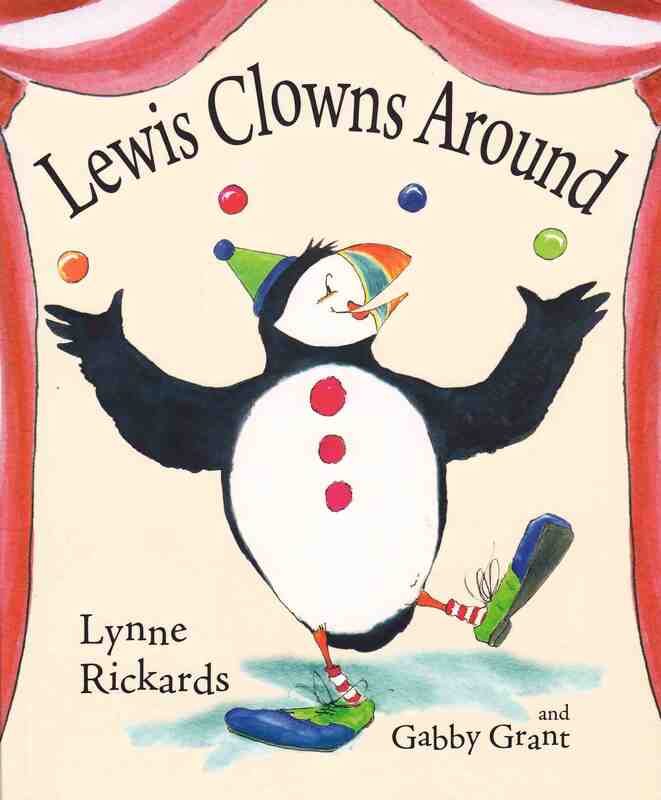 This story follows on from Lewis Clowns Around, and is all about Lewis’s brother who sets off on an adventure of his own. This is another rhyming story and it’s beautifully illustrated by Gabby Grant. 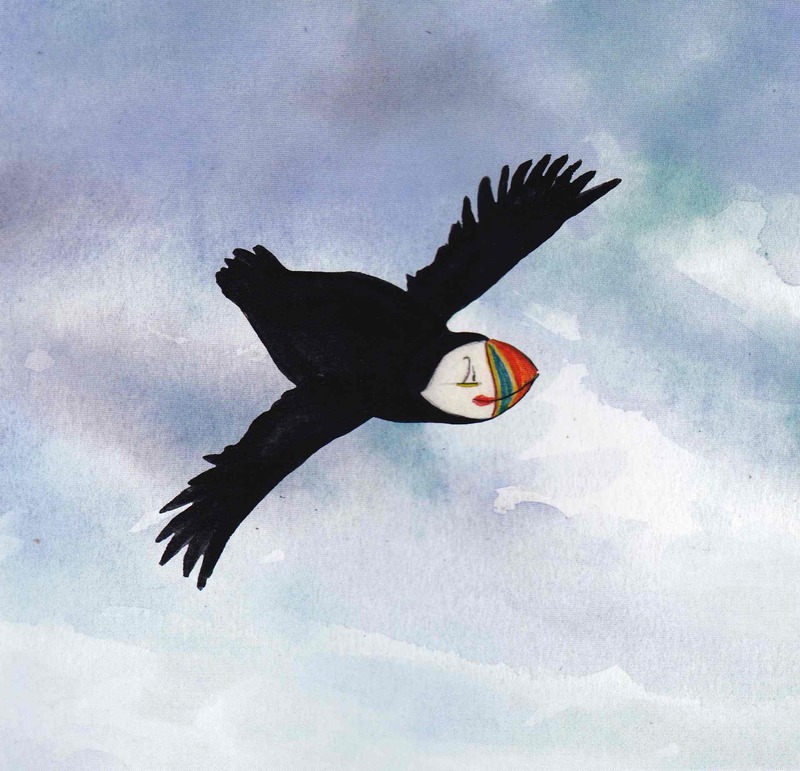 In the last book she had to draw all sorts of circus animals, from flying blue monkeys to balancing pandas, but this time she has drawn the many birds and animals that live on the east coast of Scotland. These include puffins, guillemots and seagulls that perch on the rocky cliffs. Gabby has also drawn seals, otters, dolphins, fish and one eider duck! 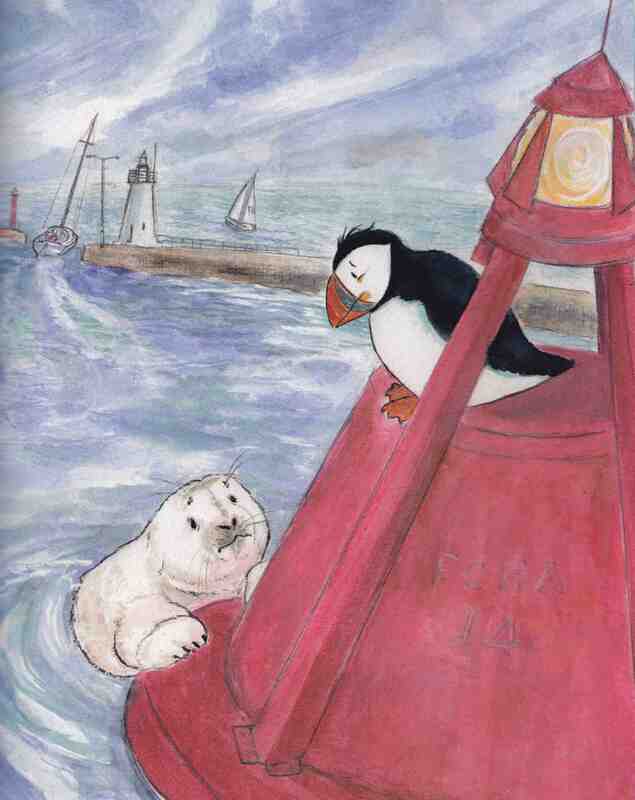 All of these creatures come to Harris’s aid when he finds a little lost seal who is stuck in Anstruther Harbour. 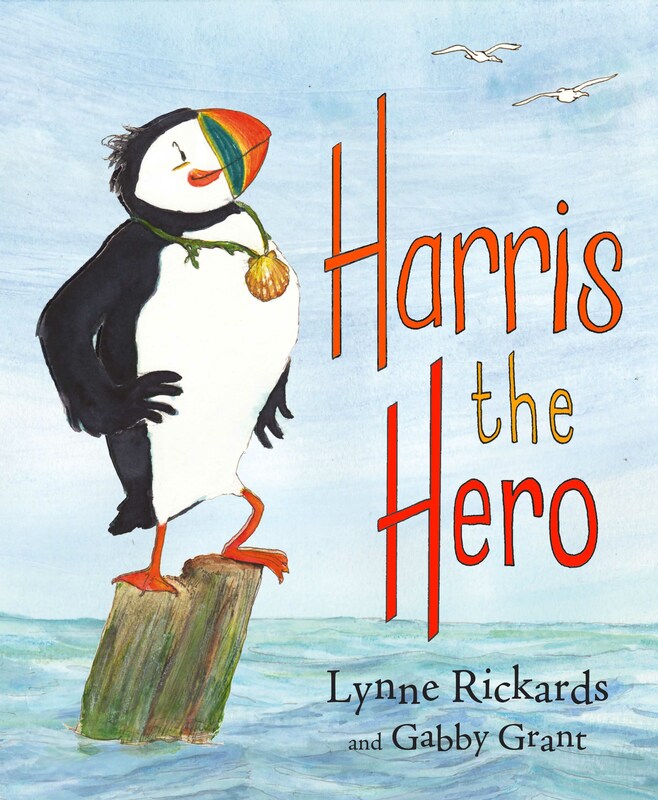 When Harris and the little seal start to struggle against giant waves, the other friends all come together to help bring the seal home again.